Bhey(lotus root) – ½ kg. Mango powder – 1 tsp. Sugar (optional) – ½ tsp. 1. Wash the Bhey thoroughly and cut them into roundels. Boil the Bhey in water till it is semi-soft in consistency. 2. In a bowl, mix the gram flour with salt, oil, asafoetida and enough water to make a batter of thick pouring consistency. 3. In another bowl, mix the chopped coriander leaves with chopped green chillies, finely chopped ginger, mango powder and sugar. Place these ingredients in a mixer to grind to a fine dry paste. Keep aside. 4. Remove the boiled Bhey from water. 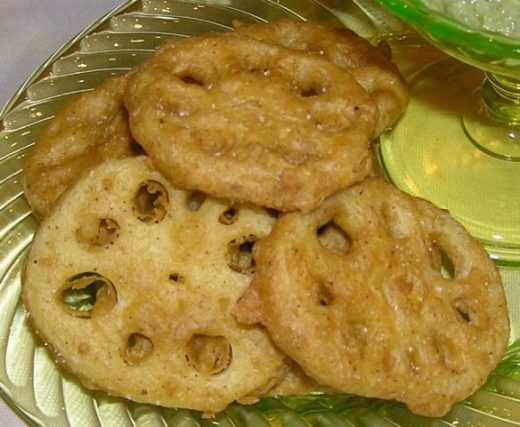 Between two roundels of Bhey, apply the chutney mix to form a Bhey sandwich. Repeat this process on all the Bhey roundels. 5. Heat the oil for frying on a medium flame. Dip the sandwiched Bhey in the batter mix and deep fry on both sides till golden brown. 6. Remove and drain off the excess oil. Serve piping hot. Bhey ja Pakora is an excellent traditional evening snack. It is served hot with green coriander chutney or tomato ketchup.